A good cleanse preparation will set you and your body up to not only get through your cleanse, but to reap the most benefits a cleanse has to offer. Adopting a few healthy habits at least three days leading up to your cleanse will allow your body to succeed in efficiently processing and absorbing the abundance of nutrients from the cleanse juices, releasing built-up toxins, leaving your body and mind with a clean slate and a healthier mentality. Morning Lemon Water and Apple Cider Vinegar: To help purify your body before your cleanse arrives, start each day with a glass of warm water with lemon juice and Raw Apple Cider Vinegar. This will jump start the detoxification process and alkalize the body. Make an extra effort to hydrate throughout your day with plenty of water. This helps your body more easily flush toxins, combats tiredness, and decreases cravings. To wean your body into consuming a raw juice diet, we recommend you take at least 3 days prior to your cleanse to cut out unnecessary and processed foods, and increase consumption of fresh and whole foods. 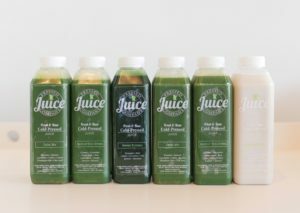 The six daily juices in your cleanse are each labeled numerically according to the order in which you are supposed to drink them. You will drink #1 first in the morning, and you will drink #6 last in the evening – we recommend you consume #6 at least 2 hours before bed to allow your body time to digest. Most people drink their juices in intervals of about 2 hours throughout the day. However, everyone’s body is different and it is important that you do what your body tells you. If you are ready for your next drink a little sooner, then go ahead. If you are not hungry for your next juice, then hold off. If you lead a very active life and need an extra juice or 2 each day, absolutely add them! 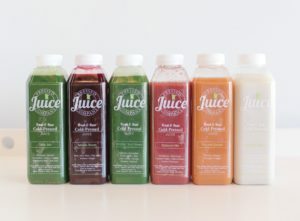 Juice Cleansing is not about deprivation. Your body will tell you what it needs. Morning Lemon Water and Apple Cider Vinegar: Start your day with a cup of warm water with lemon juice and a tablespoon of raw apple cider vinegar. This helps alkalize your body and get the digestive and detox processes started. As soon as your body is ready for something more, start with your first juice. Make an extra effort to hydrate throughout your day with plenty of water in addition to your juices. This helps your body more easily flush toxins, combats tiredness, and decreases cravings. Tip: Try Apple Cider Vinegar based dressing! Aside from lots of water and herbal decaffeinated tea, it is recommended that you consume only the juices in your cleanse. This ensures that your cleansing experience is as enjoyable and effective as possible. – Get fresh air, have fun, smile, and stay positive! Some people experience detox symptoms which could include headaches, fatigue, etc. Typically, these symptoms gradually disappear as your body adjusts to the cleanse. Everybody’s reacts differently to the cleanse process. Some people experience a variety of symptoms, while others aren’t affected at all. Throughout your cleanse, your digestive tract was resting. It is important to take a few days to gradually wean it back into full function. We recommend introducing gentler, more readily digestible meals such as salads, smoothies, soups, and juices. -Superfoods! Chia seeds, Acai & Goji Berries, Maca, Spirulina, Wheatgrass, Hemp seeds, etc.